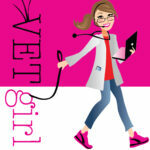 Today's VetGirl blog is an interview with feline guru Dr. Susan Little, DABVP, who tells us about some current cutting-edge research updates in feline leukemia (FeLV) and feline immunodeficiency virus (FIV). Learn about the link between inflammatory disease and FeLV/FIV, some potential treatment options for FIP with polyprenyl immunostimulant, and hints on how to make your practice more feline-friendly! Hi – I’d recommend contacting Dr. Susan Little directly at her clinic website or via social media, as she isn’t officially regulating this page. Thank you and good luck!